Image by Mike Carlson. ©2010 Endeavors magazine. To determine which tissues TH17 cells are attacking, Serody’s lab made cells containing a green fluorescent protein and then injected them into mice. 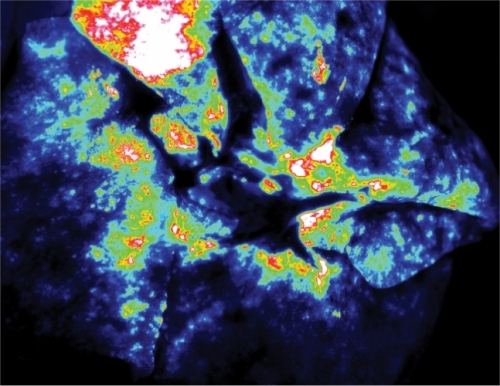 Here, a mouse lung shows intensity of fluorescence (white areas are high intensity; blue areas are low intensity). Click to read photo caption. Image by Mike Carlson. ©2010 Endeavors magazine. Anna was dangerously anemic and getting worse. Blood transfusions weren’t enough. Could anyone help? Replacing a human immune system is like swapping a standing army for mercenaries. Sturdy, reliable cells trained to fight numerous diseases are traded for new cells, unfamiliar and untested. These mercenaries can turn on their leader — the human body they’re supposed to protect. An organ transplant always comes with a risk that the recipient’s immune system will reject it. But after a bone marrow transplant — in which immune cells are transferred from a healthy donor to a sick patient — the new cells can reject the patient. “That’s called graft-versus-host disease,” says immunologist Jon Serody. Transplanted cells invade the patient’s organs and bore holes in the tissue. How exactly this happens has been a mystery for years. But now Serody and his team have shed some light on the immune cells that cause graft-versus-host disease (GVHD). They found that T-helper 17 cells (TH17), a newly discovered type of T-helper cell, may contribute to the symptoms of GVHD. Immune cells, red blood cells, and platelets are all made from hematopoietic stem cells, which live in bone marrow and produce a steady stream of blood cells throughout a healthy person’s life. But when the stem cells are damaged by disease or injury, the cells have to be replaced or the patient will die. When Anna (not her real name) was a sophomore at UNC she had a routine blood test with unexpected results. “My platelets were critically low,” she says. Anna began to get regular blood tests to monitor her platelets. Her platelet count returned to normal, but after a year it suddenly began to drop. Soon her white and red blood-cell counts dropped as well. She was referred to UNC’s bone marrow clinic, where she became one of Serody’s patients. Eventually she was found to have aplastic anemia, a condition in which stem cells don’t produce enough blood cells to meet the body’s needs. Some patients with conditions like Anna’s are treated with blood and platelet transfusions alone, but Anna’s condition was too severe. And having a lot of transfusions can close the door on other treatments. “If the transfusions didn’t work, then a bone marrow transplant would be less likely to work,” Anna says. “The more transfusions you get, the more likely that your body will attack foreign cells.” Serody and the transplant team decided that Anna’s best chance of survival would be a bone marrow transplant. Fortunately, Anna’s brother had a bone marrow type that was nearly identical to hers. Before the transplant Anna was admitted to the hospital to receive chemotherapy. The chemotherapy kills the patient’s bone marrow cells so that the patient’s immune system won’t attack the transplanted cells. Soon after receiving cells from her brother, Anna developed a really high fever — one of the first signs that a transplant is working. Even though she felt awful, Anna was ecstatic. Despite the fever, tests a few days later showed that the transplant was not working. Her body was rejecting her brother’s cells. The doctors confirmed that some of Anna’s bone marrow cells had survived the chemotherapy and killed the transplanted cells. Images by Mike Carlson. ©2010 Endeavors magazine. 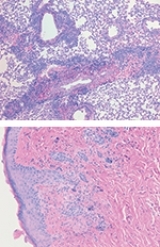 Left panel: Standard image of an inguinal lymph node from a mouse. Middle panel: The same lymph node showing fluorescence. Right panel: Intensity of fluorescence (white areas are high intensity; blue areas are low intensity). The next plan was for her brother to return for another donation. It was possible that the doctors had mistyped Anna’s brother, so they decided to test her parents. The odds that either parent had her bone marrow type were slim. Human leukocyte antigen markers, the molecules that determine bone marrow type, are inherited genetically. Siblings have a 25 percent chance of matching, but parents usually don’t have the same markers as their children. Anna’s family was not typical — her father was a perfect match. Plagued by nausea and a constantly upset stomach, she lost fifteen pounds in two weeks. Rashes sprang up all over her body. Anna’s immune system wasn’t rejecting the transplanted cells — this time, the transplants were rejecting Anna. She had contracted GVHD. The managers of the immune system, T-helper cells, direct other immune cells to generate antibodies and find cells afflicted with pathogens and destroy them. To accomplish these tasks, T-helper cells release molecules called cytokines that tell the other cells what to do. GVHD patients have excess amounts of a cytokine associated with TH1 cells, so scientists thought that the disease was caused primarily by TH1 cells. Serody’s team removed the TH1 cytokine from immune cells and then used the cells to perform bone marrow transplants on mice. They expected the mice to stay healthy. Instead, the mice still contracted GVHD and it was worse than before. At that point, Serody suspected that TH1 cells were a red herring. One other possibility was a newly discovered type of T-helper cell: TH17 cells. Images by Angela Mortari. ©2010 Endeavors magazine. The symptoms of GVHD depend on which tissues are attacked by the patient’s new immune system. The most commonly targeted organs include the skin, gastrointestinal tract, liver, and lungs. These mouse tissues show damage caused by TH17 cells. Top: Lung tissue. Bottom: Skin tissue. Click to read photo caption. Images by Angela Mortari. ©2010 Endeavors magazine. TH17 cells produce a cytokine that’s been implicated in autoimmune disorders. The problem was that no one had figured out how to isolate the cells. Postdoctoral researcher Mike Carlson developed a method to grow a pure population of TH17 cells. Serody’s team used these to perform more bone marrow transplants on mice and monitored the animals for symptoms of GVHD. All of the hallmark symptoms appeared, including skin rashes and hair loss. These mice were the first animal models of GVHD to develop severe skin problems like those found in human patients. Serody’s team had not only uncovered a potential source of symptoms, but also created a better model to study the disease. Now Serody and his team are working on methods to target and inactivate TH17 cells. All of their experiments are done in mice, but most results using the mouse bone marrow transplant model have been replicated in humans, Serody says. Treatment for GVHD has made Anna’s life more complicated. Following her transplant she was forced to spend most of her time indoors. And even when her condition improved enough for her to venture out of the house, she had to avoid crowds and take extra precautions to prevent herself from getting sick. “I think I should have bought stock in hand sanitizer,” she says. “I’ve used a lot of it.” Anna hopes that someday Serody’s work will give GVHD patients more freedom. After being forced to live such a sheltered life, a treatment that could reduce the time a patient has to be isolated is very appealing to her. Anna’s blood cell counts are finally beginning to stabilize, which means that her father’s immune cells are adapting to her body. She is still receiving treatment for GVHD but her immune system is strong enough now that she can work a full-time job. Anna hopes to be off most of her medications within a year. A strong believer in social justice, she’s interested in violence prevention and helping victims of trauma. She’s especially looking forward to returning to volunteer work. “I’m glad I can finally help other people again,” she says. Meagen Voss received a master’s degree in neurobiology in spring 2010. Jon Serody is the Elizabeth Thomas Professor of Medicine, Microbiology, and Immunology in the School of Medicine. He is a clinician in the Lineberger Comprehensive Cancer Center’s Bone Marrow and Stem Cell Transplantation Program and in the Division of Hematology and Oncology in the North Carolina Cancer Hospital. Mike Carlson is the primary author of the TH17 study. This work was the cover story for the February 5, 2009, issue of Blood. Funding for the research came from the National Institutes of Health and the Mary Elizabeth Thomas Endowment Fund. Filed in surgery & internal medicine. From the Winter 2010 issue of Endeavors.